Hope you have already had time to check our new car rental app demo displaying how DHTMLX Scheduler .NET web control can be modified to implement a car rental application with a search field and a customer’s order form. As promised, we elaborated the most precise tutorial to let you create a car rental sample for ASP.NET MVC3 in the shortest possible time. The tutorial covers the essential steps of the new app creation and includes descriptions, pictures and full code examples. You can skip reading this tutorial and simply download a ready package right now. Let’s create a simple application with a calendar that has a vertical car arrangement and a search field to filter the available cars by price and type. As the first step, we create a new ASP.NET MVC3 Web Application with the Razor view engine. For initialization add the .dll library reference and scripts from the DHTMLX Scheduler .NET package to your project folder. If you need help with that, please, refer to the items 2-3 of our ASP.NET simple event calendar tutorial. Let’s make the TypeId field a foreign key that refers to [Type].id field. Like with the ‘Car’, table make’ the Car_id field a foreign key that refers to [Car].id field. Set primary key to the id columns of the three tables. Remember to change the properties of the identity column to id. 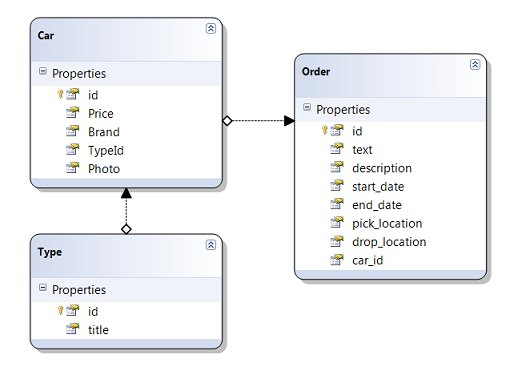 When the tables are completed, create a data model LINQ to SQL Classes. Name it Rental and drag the newly created tables onto the LINQ to SQL designer surface. To facilitate rendering of the Order collection as a json string during data loading, no cyclic links between ‘Order’ and ‘Type’ should be set. Go to Views, create a new folder ‘Home’ and add Index.cshtml. Delete the views we do not require from the folders Home and Shared, that’s Error.cshtml and About.cshtml. Go to Home -> Index.cshtml to make changes also to the calendar page. The Scheduler initializes in the container of the set height. The number of cars (and consequently, the actual calendar height) can be different. It depends on the search form output. We’ve chosen the default height of 7 lines. If there are < 7 lines, the calendar height is equal to the number of lines. If there are > 7 lines in the calendar, scrolling is enabled while the calendar height is set to the default 7 lines. The next stage is to create a controller. Right-click on the Controllers folder in the Solution Explorer and create HomeController.cs. It’s easy to implement filtration with LINQ to SQL. We simply add several where filters. It means, LINQ doesn’t filter the collection each time when we call Where(). LINQ to SQL will translate these conditions into the equivalent SQL query and send it to the SQL server for processing just before cars collection is enumerated. We set a 2 step time interval for car order with the scale of 12 cells in the TimelineView. Columns and rent boxes height as well as the height of rows are also set here. The function scheduler.Views.Clear(); removes the default scheduler views. Create a list of select options in the controller and pass them to view via ViewData. Retain the selected values in the controls after page reload. Note: Save and Data methods we use in this app are described in the Simple ASP.NET MVC application with Scheduler. Copy the available car images (image size is 80x48 px) to the Content folder of your project. Right-click on the database in the Server Explorer to create a new query. 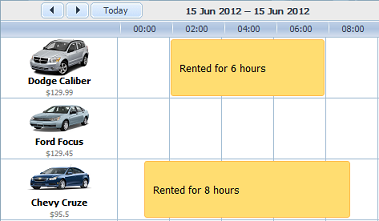 Add the car rental static data to the tables Cars and Types, and execute the SQL file. The data and the necessary pics are available in the download package. 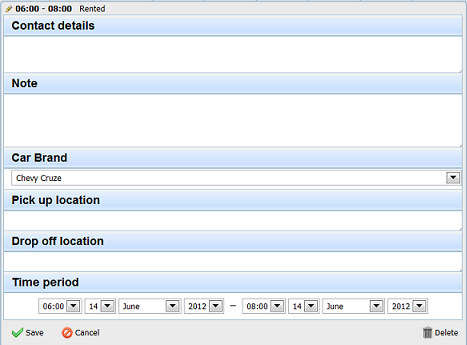 Date is selected from the two inputs – date picker and ‘select time’ drop-down list. We add a function to HomeController.cs to parse the date to the DataTime object. The calendar with a date filter is ready. That’s it! 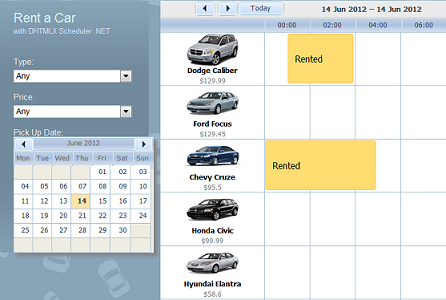 Car rental application for ASP.NET MVC3 Razor is ready to use. Sign up now and get a ready car rental service. If you find this tutorial helpful, you are welcome to comment below and share it with your friends.